Due to the conversion of this historic Neoclassical style mansion built in 1903, HCL Sales will be selling all of the antique chandeliers and lighting, tapestries, fixtures and equipment to the general public. 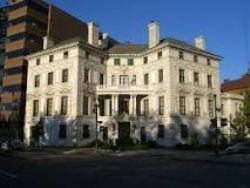 The mansion that is listed on the National Register of Historic Places was home to the Washington Club since 1951. The sale will be conducted by appointment only. For more information please call 770-451-4028.